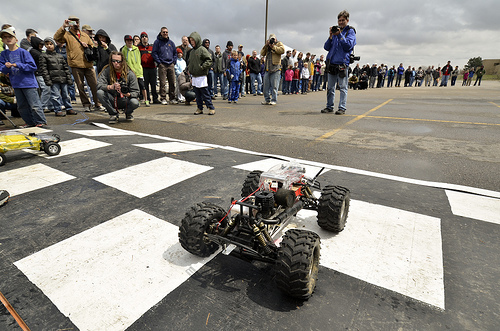 “AVC” is short for “Autonomous Vehicle Competition”, and this is our fourth time hosting this event. In the past, we've ran this as a spring-time event - leaving the vehicles susceptible to various types of inclement weather. So, by popular demand, we have moved the AVC to the sunny Colorado summer! That's right, on June 16th, 2012, AVC madness will descend on SparkFun headquarters. Read on for more details! The basic idea behind the competition is to invite people to build an autonomous vehicle that can circumnavigate SparkFun headquarters without any human interference. Whoever does it the fastest, wins! There are quite a few more rules - read them here. We withhold the right to update them at any time, but we'll be sure to make it obvious if we do. If you're a veteran of previous AVC's, check the rules carefully as there have been a few adjustments this year. Most notably is this one new rule: no quadcopters or heli's of any kind. I know, I know - people love the quads. We do too, truthfully. But they are pretty dangerous and as the event (and crowd) grows, the risk isn't worth the reward. So leave the quad's and heli's at home - sorry folks. The AVC has become our signature event and is something we are really looking forward to this year. It'll be an awesome day of robotics! Add to that some good times with good company, good music from the house band, and food vendors and I can't think of a better way to spend a Saturday! If you want to register a team go here. But if you'd just like to attend as a spectator, please register at our EventBrite page. Hope to see you there! I'm excited, but no quadrocopters? That was my favorite part last year. And seems like the planes were much more dangerous as far as crashing into the crowd. OK, let me address this before it gets out of hand. An electric motor/prop will chop the bejesus out of somebody. So picture hundreds of people within 30 feet of an electric quad/heli (about what the starting line looks like) that's deciding for itself how to fly. If it somehow fails and starts flying erratically (like we saw last year), nobody's going to have time to protect themselves. If my kid got mauled by that, God help SparkFun because I'd be coming for them, waiver or no. I've been hit by electric planes before, though missed the prop. I've walked away from those incidents. You're much less likely to walk away from a quad/heli, and you'll have much less time to react. Do it battlebots style, buy a few hundred sheets of 1/4" plexiglass and encase the spectators/playing arena, like in hockey and nascar, haha... maybe one day AVC will be lively enough to afford that! Am I missing something? Isn't the prospect that the audience can be gored by a frenzied, autonomous, airborne death-bot one of the main draws of this competition? It's like those bullfights in Spain, where you only go there to see the matador get ripped to shreds by the bull, uh, right? It's possible to make a quad copter safe by surrounding the props with a blade guard (like your generic Hunter desk type fan). HINT: new Sparkfun product ... quadcopter fan blade guards! BTW, I've always wondered why they have to be QUAD copters, couldn't you get one with THREE engines to fly? (An array of three could still balance though the software would be a bit different as you have work out the four to three dimension conversions). Also ... would a biped robot be considered an AV? Look at my avatar to see where I might like to eventually be going with this idea (though not anytime real soon!). How about just ONE engine... we'll call it a "helicopter". Don't forget the tail rotor! I'm trying to build a quadcopter and I'm already planning on a blade guard. That was my first thought when doing a thrust test. I thought that blade would chop my head off if the prop went missing, and it was not a nice thought. As you mentioned the easiest way to do it is similar to the fan ones. I'm using a metal mesh to build it but it would be a pretty cool product to buy. I like the idea of requiring a blade guard on the aircraft and then allowing quadracopters. The problem with blade gards is that it makes the vehicle heavier, therefore you need bigger motors and props..and batteries.. you see where iÂ´m getting. The second and bigger problem is that prop gards usually cover only the edges of the blades, not the middle. When thereÂ´s an out-of-control multirotor craft flying towards you, you naturally tend to protect yourself with your hands and they are 80% likely to hit a 10kPRM+ rotating prop, since the area on a multirotor is mostly ..rotating props. I almos lost a finger like that. IÂ´ve built a hexacopter and had it on top of a table for testing while i was facing the blades from above. Accidentaly a friend of mine hit the start switch while the throttle was set over 50%. Imagine 6 blades coming toward my face in half a second all of a sudden. It wasnÂ´t pretty but thank God nothing to serious happened. I like the idea of building a "cage-like-arena" of some sort, tho. yes, tricopters do exist, I made one.... and the avatar thing: AWESOME click on the link it is really cool! Yeah great video but I guess you missed my hint or I've dated myself here. Guess no one here has heard of Tezuka. Even-numbered copters are easier because you can balance out the rotor torques (half the blades turn CW, half turn CCW). But tricopters exist too; they use a small servo to angle one rotor to adjust overall torque. William Thielicke's "Shrediquette" copter is a good DIY example. So are hovering aircraft allowed? I.e. if the vehicle doesn't have a tail rotor (not a helicopter) and only has one or two props (not a quadcopter), is that OK? Would something like the Convair pogo (http://youtu.be/Nh9dhBJY010) be allowed? Or is the intent to ban eye-level, hovering vehicles so that most of the race is conducted at a "safe" altitude? Finally, does a hovercraft count as an air or a ground vehicle? Hovercraft = ground vehicle, and I did approve the Horizon Hobby version of the Pogo for someone yesterday. But yeah, we're trying to have as few blades running at crowd level as we can. Yeah, there's something I rather like about the "floating blender of doom" aspect of quads. I've been working on and off on one myself. But we want people to have a good time at the AVC and if there are any painful experiences they should be the learning kind like "My bot went in the pond! Well... maybe I'll put floats on it next year..."
There isn't much to learn from getting sliced by a copter except never leave home without your umbrella. WHAT?! JUNE?! Now I don't get to miss school! Oh well, the bright side is I will actually get my homework done this year instead of using the excuse "I was too busy programming my robot"
And that was why homeschooling was invented. It is too bad no quads. They seem to be the best possible vehicle for this competition. The short distance and precise movement involved screams for quads. Airplanes would certainly be better if long distances were involved but that is not the case here. Wouldn't the quads be safe if they had protection over the blades? Maybe some type of ducted fan setup would be safe? Yup Support no quads; until the designs become sane - and yes, there are some fully enclosed designs. Personally, I applaud the no quad (prop/rotor/spinning blades of death) vehicles. It's not that I don't like to see them and/or participate (some day), but it's the shear danger level with them. Sure they are meant to fly up and above the spectators, but having seen last year's competition, I knew something needed to be done. It's like a bee hive when one of those things take off, both adults and children, especially children, will chase these things down and come within FEET of them. They can reach out and touch the darned thing. Sure, they can be programmed to fly a minimum of 30 feet in the air .. doesn't matter. As Pete pointed out, if anything happens with the vehicle, guess where it is more likely to go: DOWN. And with hundreds of fleshy bodies around, it could spell disaster for some poor kid or adult. Maybe in the future we can come up with a better solution and bring them back, but I'd say for now we should limit them. Good decision. I fully support the no quads decision, the arena is just too small. Tiny brushless motors that weigh less than a pound and put out over a horsepower are just too dangerous this close to the spectators. It's possible to build a quad that's capable of lifting a child off the ground with just electric motors. I'm stoked! I'm into the motor testing phase for my robot, I think Team Tobor is going to be in for some competition this year! Will I be contacted via e-mail for the particulars, like my team name, etc? http://www.sparkfun.com/products/11069 just takes me to http://learn.sparkfun.com/- is there a live page that still has the rules on them? You can try checking out the preview video at http://www.sparkfun.com/news/871, which should have some of the rules. I'm not sure why the other links don't direct to live pages. We'll look into that! Just a packing slip for qty (1) CLS-11069 Autonomous Vehicle Competition, 2012. Methinks your shipping system needs some tweaking. LOL. Usually, when the effort to ship something is warranted, an actual item to ship is associated with that effort. Sweet! Thanks for the early notice. Data Bus was excited when I told him. We're both happy to know it's during a warm/dry time of year, too. Wha...? Already? Key-ripes. I better send out an email today. Just wait until an Airplane with a prop out front decides to kamikaze a baby stroller. It really doesn't matter whether it is a multi-copter or heli - anything in the air can do some serious crowd damage in the blink on an eye. Even if the prop is in the back of the plane or covered a nosedive from 30-50 feet can do significant damage to a crowd in a hurry. 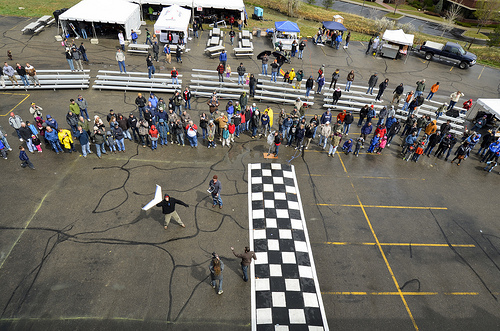 To be safe, flying bot competitions need to be held somewhere away from a crowd. Take a look at the safety regulations for the AMA or Aerial Robotics Competition. Funny you should mention that. There actually was a plane that hit a stroller at last year's competition ... :) And I know someone took pictures, I just don't see them posted in the Flickr stream. Well, ideally. I grew up in Colorado and throughout my existence I've seen snow happen in every month of the year at elevations similar to SparkFun's. Also, June is prime thunderstorm/hail season. Be prepared for anything. Damn, I was looking forward to taking my copter to compete. there are plenty of places nearby where folks could organize a separate quadcopter/heli race, and have the crowds kept at a safer distance. Hurray for NOT so early in the year (last year was a bit windy and cold)! Looking forward to some awesome robots and hopefully some good weather to go with it! Boo for not so early in the year. I'll be away the second half of June, so I'm going to miss this one. I've really enjoyed it the past few years, and not just the day of fun, competition, and accidental pond encounters; but also chatting up the great Sparkfun folks at the Dark Horse afterwards. I definitely recommend all attend this who are able!